In 1994, SIG Writing decided to initiate a book series on Writing Research to create a forum for writing research, which was lacking at that time. Members of the SIG Writing formed the “Studies in Writing” editorial board, and the SIG coordinators, Gert Rijlaarsdam and Eric Espéret acted as series editors. Books in this series include edited volumes and research monographs. The initial volumes were published by Amsterdam University Press (1-6), then moved to Kluwer Academic Publishers/Springer (7-16), then passed to Elsevier (17-21), who then sold the portfolio to Emerald (22-26). As of Volume 27, Brill acquired the Studies in Writing series and is the current publisher. Click here to visit the current portfolio at Brill and here to access Studies in Writing's current catalog. Click here to access Studies in Writing's current catalog. Current Series Editors are Raquel Fidalgo from the Area of Developmental and Educational Psychology of the University of León (rfidr@unileon.es) and Thierry Olive from the Research Center on Cognition and Learning of the National Center for Scientific Research-CNRS (thierry.olive@univ-poitiers.fr). #30: Archer, A., & Breuer, E. O. (Eds.). (2015). Multimodality in Writing: The State of the Art in Theory, Methodology and Pedagogy. Leiden: Brill. Multimodality in Writing attempts to generate and apply new theories, disciplines and methods to account for semiotic processes in texts and during text production. It thus showcases new directions in multimodal research and theorizing writing practices from a multimodal perspective. It explores texts, producers of texts, and readers of texts. It also focuses on teaching multimodal text production and writing pedagogy from different domains and disciplines, such as rhetoric and writing composition, architecture, mathematics, film-making, science and the newsroom. 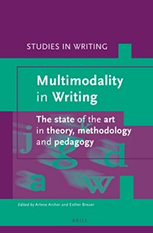 Multimodality in Writing explores the kinds of methodological approaches that can augment social semiotic approaches to analyzing and teaching writing, including rhetoric, Systemic Functional Linguistics, ethnographic approaches, and genre pedagogy. Much of the research shows how the regularities of modes and interest of sign makers are socially shaped to realize convention. Because of this, the approaches are strongly underpinned by social and cultural theories of representation and communication. #29: Deane, M., & Guasch, T. (Eds.). (2015). Learning and Teaching Writing Online: Strategies for Success. Leiden: Brill. 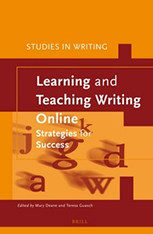 Learning and Teaching Writing Online: Strategies for Success takes a fresh look at the challenge of supporting writers online, and reports on research from around the world to offer a range of learning and teaching strategies. The main themes are feedback in online environments, collaboration through online environments, and course design for online environments.This book is designed for higher education practitioners who are interested in exploring pedagogic approaches for giving feedback and supporting collaborative writing online. It will also appeal to researchers of writing development and technology enhanced learning. Writing Pedagogy in Online Settings—A Widening of Dialogic Space? #28: Klein, P. D., Boscolo, P., Kirkpatrick, L. C., & Gelatti, C. (Eds.). (2014). Writing as a Learning Activity. Leiden: Brill. 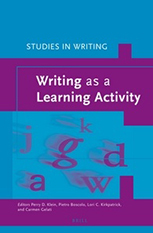 Writing as a learning activity offers an account of the potentials of writing as a tool for learning. Four aspects of writing emerge particularly clearly through the chapters. First, writing to learn depends on the cognitive strategies of the writer; instruction in such strategies contributes significantly to the ability to use writing as a learning tool. Secondly, strategies for writing and reasoning are largely specific to academic disciplines. Thirdly, writing is not, as traditionally conceived, only an individual ability, but also an activity that is social. It is a collaborative practice facilitated by representational tools-- books, computer, notes, schemata, drawings, etc. – by which knowledge is acquired, organized, and transformed at various levels of complexity. Fourthly, writing is a productive activity, exemplified by the varied and positive effects of writing on learning different subjects at various educational levels. #27: Van Steendam, E., Tillema, M., Rijlaarsdam, G., & van den Bergh, H. (Eds.). (2012). 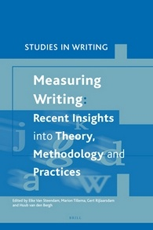 Measuring Writing: Recent Insights into Theory, Methodology and Practice. Leiden: Brill. This volume provides a state-of-the-art overview of theory, methodology and practices in the assessment of writing. The focus throughout the book is on the construct of writing and its assessment: what constitutes writing ability and how can it be defined (in various contexts)? This question cannot be answered without looking into the methodological question of how to validate and measure the construct of writing ability. Throughout the book, therefore, discussions integrate theoretical and methodological issues. 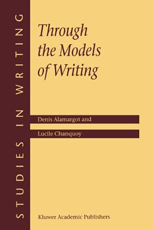 A number of chapters discusses whether varying definitions and varying operationalizations of writing ability are needed in various contexts, such as formative assessments versus summative assessments, large scale assessments versus individual assessments, different tasks, different genres, and different languages, but also different age groups. A range of rating methods is investigated and discussed in this book. The ongoing debate on holistic versus analytic ratings, and the different underlying conceptions of writing proficiency, is a pertinent matter, on which a number of chapters in this volume shed new light. The matter is discussed and analyzed from various angles, such as generalizability of judgements and usability in formative contexts. Another fundamental debate concerns computer scoring of written products. A nuanced discussion of its validity is presented in this volume. #26: Baca, I. (Ed.). (2012). Service-Learning and Writing: Paving the Way for Literacy(ies) through Community Engagement. Leiden: Brill. 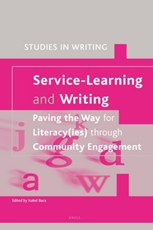 Service-learning and Writing: Paving the Way for Literacy(ies) through Community Engagement discusses service-learning as a teaching and learning method and its integration with writing. The various authors, from different disciplines and institutions, present service-learning as a means of having students practice writing in real world settings, and they show how relationship-building and partnerships between higher education and diverse communities produce benefits for all involved - the students, faculty, administrators, and the communities themselves. This volume demonstrates how writing instruction and/or writing practice can complement community engagement and outreach at local, national, and international contexts. Through different cross-cultural contexts and academic disciplines, the various authors explore reflection, assessment, internalization, diversity, and multiple literacies and their importance when integrating service-learning in higher education and community literacy. #25: Torrance, M., Alamargot, D., Castelló, M., Ganier, F., Kruse, O., Mangen, A., Tolchinsky, L., & van Waes, L. (Eds.). (2012). 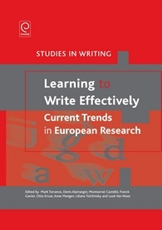 Learning to Write Effectively: Current Trends in European Research. Amsterdam: Elsevier. 1.8. Construct-Relevant or Construct-Irrelevant Variance in Measures of Reading? 2.1.3. Are Help Levels Effective in Textual Revision? 2.1.6. Can Different Instructional Programmes Achieve Different Results on Students’ Writing Attitudes and Writing Self-Efficacy? 2.3.3. What Is ‘Improvement’ in L2 French Writing? 2.4.1. What Do Portuguese University Students Say About Their Writing in Exams? 2.4.6. Does the Quality of Teaching Determine Students’ Achievement in Writing? 2.4.9. Writing Counter to Personal Opinion: Can Advanced Communication Students Set Aside Their Own Understanding of a Field? #24: Castelló, M., & Donahue, C. (Eds.). (2012). University Writing: Selves and Texts in Academic Societies. Amsterdam: Elsevier. 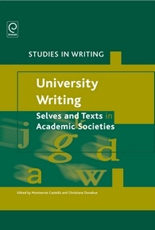 University Writing: Selves and Texts in Academic Societies examines new trends in the different theoretical perspectives (cognitive, social and cultural) and derived practices in the activity of writing in higher education. These perspectives are analyzed on the basis of their conceptualization of the object - academic and scientific writing; of the writers - their identities, attitudes and perspectives, be it students, teachers or researchers; and of the derived instructional practices - the ways in which the teaching-learning situations may be organized. The volume samples writing research traditions and perspectives both in Europe and the United States, working on their situated nature and avoiding easy or superficial comparisons in order to enlarge our understanding of common problems and some emerging possibilities. In addition, the volume promotes a dialogue between these perspectives and traditions and, by addressing the identified needs and unsolved questions, bridges gaps and move forward in our knowledge regarding academic writing activities in higher education settings. 1. Academic and Scientific Texts: The Same or Different Communities? 7. Enunciative Strategies and Expertise Levels in Academic Writing: How Do Writers Manage Point of View and Sources? #23: L’Abate, L., & Sweeney, L. G. (Eds.). (2011). Research on Writing Approaches in Mental Health. Amsterdam: Elsevier. Writing as a medium of professional help and healing in the various interventional tiers of self-help, education, promotion, prevention, and psychotherapy, and rehabilitation has expanded exponentially since the introduction of computers and the Internet in the last generation. This volume does three things. Firstly, it brings together research on different types of writing and distance writing that have been, or need to be, used by mental health professionals. Secondly, it critically evaluates the therapeutic effectiveness of these writing practices, such as automatic writing, programmed writing poetry therapy, diaries, expressive writing and more. 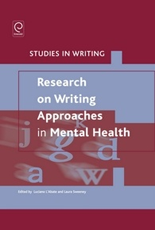 And thirdly, in addition to evaluating the effectiveness of various writing practices, the volume will examine how research-based writing approaches will influence the delivery of mental health services now and in the future, including the implications of these approaches. #22: Ha, P. L., & Baurain, B. (Eds.). (2011). 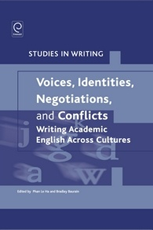 Voices, Identities, Negotiations, and Conflicts: Writing Academic English Across Cultures. Amsterdam: Elsevier. This volume aims to provide insights into the process of knowledge construction in EFL/ESL writing - from classrooms to research sites, from the dilemmas and risks NNEST student writers experience in the pursuit of true agency to the confusions and conflicts academics experience in their own writing practices. Knowledge construction as discussed in this volume is discussed from individualist, collectivist, cross-cultural, methodological, pedagogical, educational, sociocultural and political perspectives. 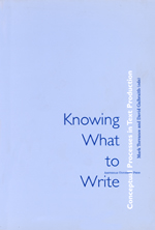 The volume features a diverse array of methodologies and perspectives to sift, problematise, interrogate and challenge current practice and prevailing writing and publishing subcultures; and most importantly, it does so by presenting to readers that writing for publications should genuinely be for knowledge development and should not be restricted to only the considered 'knower of the game'. In this spirit, this volume wishes to break new ground and open up fresh avenues for exploration, reflection, knowledge construction, and evolving voices. #21: Alamargot, D., Terrier, P., & Cellier, J.-M. (Eds.). (2007). Written documents in the workplace. Amsterdam: Elsevier. This title is divided into three parts, the first of which provides a linguistic definition of professional documents, describing their different types and genres. This definition necessarily takes into account both the formal characteristics of these types of document (e.g. nature of linguistic units involved) and their functional goals (the way these linguistic units are used to fulfill the text's communicative aim). The second part focuses on the mental mechanisms involved in written production in the workplace. One of the aims of a professional writer is to compose a text which can be understood. Text composition involves specific processes and strategies that can be enhanced. One way of doing this is to give the writer suitable instructions, while another is to provide him/her with a suitable writing environment. This last aspect leads us to devote the third and final section to the comprehension of written documents in the workplace. Awareness of the strategies implemented by different readers (with more or less domain expertise) in order to understand technical and professional documents can enhance the latter's readability. This title includes contributions from linguists, psychologists and ergonomists from various countries ensure international scope and comprehensiveness. It bridges the gap between fundamental research into writing and reading and the issue of the efficiency of written communication in the workplace. It enables better content creation for professional writers. 16. Animated documentation: A way of comprehending complex procedural tasks? #20: Torrance, M., van Waes, L., & Galbraith, D. (Eds.) (2007). Writing and cognition: Research and applications. Amsterdam: Elsevier. Writing is central to the functioning of developed societies. However, the psychological processes that allow us to transform complex ideas into language and express them on paper or computer screen are poorly understood. Writing and Cognition goes some way towards remedying this. It describes new and diverse work both by field leaders and by newer researchers exploring the complex relationships between language, the mind, and the environments in which writers work. Chapters range in focus from a detailed analysis of single-word production to the writing of whole texts. They explore the basic processes involved in writing, the effects of writing on thought and how these vary across different educational and workplace contexts: How do student writers differ in how they approach their text? What processes are associated with the transformation of knowledge during writing? How do the writers of press releases balance the demands of message and reader? Where do writers look when they write? Is memory retrieval easier in writing or when speaking? How does dyslexia affect text production? How does writing by speech-input differ from traditional keyboarding? This volume is essential reading for writing researchers. It will also interest educators, linguists, psychologists, psycholinguists, and anyone who wants to find out more about how thought is transferred to the page. It investigates the psychological processes that allow us to transform complex ideas into language and express them. The chapters examine a wide range of writing contexts and issues. Contributors include field leaders and newer researchers, allowing for a diversity of opinion. #19: Hidi, S., & Boscolo, P. (Eds.). (2007). Writing and motivation. Amsterdam: Elsevier. The aim of this volume is to bring together contributions from international research on writing and motivation. 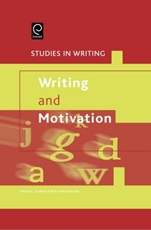 It not only addresses the basic question of how motivation to write can be fostered, but also provides analyses of conceptual and theoretical issues at the intersection of the topics of motivation and writing. What emerges from the various chapters is that the motivational aspects of writing represent a rich, productive and partially still unexplored research field. This volume is a step in the direction of a more systematic analysis of the problems as well as an effort to present and compare various models, perspectives and methods of motivation and writing. It addresses the implications of writing instruction based on the 2 main approaches to writing research: cognitive and socio-cultural. It provides systematic analysis of the various models, perspectives, and methods of motivation and writing. It brings together the international research available in this burgeoning field. 5. Writing on an interesting topic: Does writing foster interest? #18: Sullivan, K. P. H., & Lindgren, E. (Eds.) (2006). Computer keystroke logging and writing. Amsterdam: Elsevier. Computer keystroke logging is an exciting development in writing research methodology that allows a document's evolution to be logged and then replayed as if the document were being written for the first time. Computer keystroke logged data allows analysis of the revisions and pauses made by authors during the writing of texts. Computer Keystroke Logging and Writing: Methods and Applications is the first book to successfully collect a group of leading computer keystroke logging researchers into a single volume and provide an invaluable introduction and overview of this dynamic area of research. This volume provides the reader unfamiliar with writing research an introduction to the field and it provides the reader unfamiliar with the technique a sound background in keystroke logging technology and an understanding of its potential in writing research. In the core of the methods section, leading researchers demonstrate how keystroke logging can be used to analyze the writing process phenomena of the pause, the writing unit and the revision unit. These phenomena are illustrated with data from current keystroke logging research projects. The final section of the book explores a range of application possibilities for computer keystroke logging. 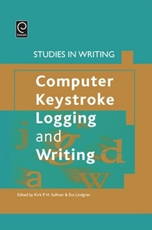 These include how keystroke logging can be used to study; how translators approach their work; how keystroke logging, alone or coupled with other techniques, can be used to examine theoretical proposals and models; and, how keystroke logging can be used in pedagogical settings. It includes work from the world's leading researchers in one volume. It provides an excellent introduction and overview of key-stroke logging. It includes a discussion of applications for this exciting new field. #17: van Waes, L., Leijten, M., & Neuwirth, C. (Eds.). (2006). Writing and digital media. Amsterdam: Elsevier. Digital media has become an increasingly powerful force in modern society. 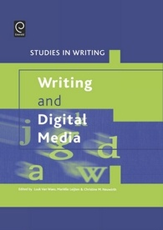 This volume brings together outstanding European, American and Australian research in "writing and digital media" and explores its cognitive, social and cultural implications. The book is divided into five sections, covering major areas of research: writing modes and writing environments (e.g. speech technology), writing and communication (e.g. hypervideos), digital tools for writing research (e.g. web analysis tools, keystroke logging and eye-tracking), writing in online educational environments (e.g. collaborative writing in L2), and social and philosophical aspects of writing and digital media (e.g. CMC, electronic literacy and the global digital divide).In addition to presenting programs of original research by internationally known scholars from a variety of disciplines, each chapter provides a comprehensive review of the current state-of-the-art in the field and suggests directions for future research. This wide-ranging international volume presents the very best of current thinking in the field and will be indispensable to anyone doing or contemplating work in the area, both for established researchers as well as newcomers, including graduate students. It reviews European, American and Australian research in the cognitive, social and cultural implications of writing for digital media. It addresses writing modes and environments, writing and communication, digital tools for writing research, online educational environments, and social and philosophical aspects. It is indispensible for anyone doing or researching work in the area, from academics to practitioners and the general public. #16: Shum, M. S., & Zhang, D.-L. (Eds.). (2005). Teaching writing in Chinese speaking areas. New York: Springer. One of the most civilized nations in history, China has a long-standing writing tradition and many Chinese texts have become world treasures. However, the way the Chinese teach writing in various countries in contemporary times is little known to the outside world, especially in Western countries. Undoubtedly, the Chinese have had an established traditional method of writing instruction. However, recent social and political developments have created the perception amongst both practitioners and researchers of a need for change. Whilst certain socio-political changes, both in Mainland China and in the territories, acted as agents for reform of the teaching of composition, the shape these reforms are taking has been due to many different influences, coming both from inside the countries themselves and from foreign sources. Mainland China, Hong Kong, Taiwan and Singapore have each developed their own approach to the teaching of composition. #15: Kostouli, T. (Ed.). (2005). Writing in context(s). Textual practices and learning processes in sociocultural settings. New York: Springer. The premise that writing is a socially-situated act of interaction between readers and writers is well established. This volume first, corroborates this premise by citing pertinent evidence, through the analysis of written texts and interactive writing contexts, and from educational settings across different cultures from which we have scant evidence. Secondly, all chapters, though addressing the social nature of writing, propose a variety of perspectives, making the volume multidisciplinary in nature. Finally, this volume accounts for the diversity of the research perspectives each chapter proposes by situating the plurality of terminological issues and methodologies into a more integrative framework. Thus a coherent overall framework is created within which different research strands (i.e., the sociocognitive, sociolinguistic research, composition work, genre analysis) and pedagogical practices developed on L1 and L2 writing can be situated and acquire meaning. This volume will be of particular interest to researchers in the areas of language and literacy education in L1 and L2, applied linguists interested in school, and academic contexts of writing, teacher educators and graduate students working in the fields of L1 and L2 writing. #14: Rijlaarsdam, G., van den Bergh, H., & Couzijn, M. (Eds.). (2005). 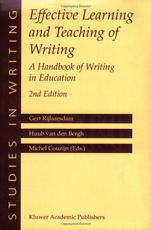 Effective learning and teaching of writing: A handbook of writing in education. Dordrecht: Kluwer. 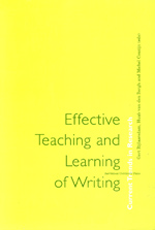 Effective Learning and Teaching of Writing is a handbook on research on the effective teaching and learning of writing. It is a reference for researchers and educators in the domain of written composition in education. Effective Learning and Teaching of Writing covers all age ranges and school settings and it deals with various aspects of writing and text types. Research methodology varies from experimental studies to reflective classroom practitioners’ research. This new volume in the series Studies in Writing brings together researchers from all kinds of disciplines involved in writing research and countries in their endeavour to improve the teaching of written composition. It is the result of co-operation of researchers all over the world and shows that in spite of the differences in educational regions over the world, research in writing shares similar problems, and tries to find answers, and generate new questions. The body of knowledge in this volume will inspire researchers and teachers to improve research and practice. #13: Allal, L., Chanquoy, L., & Largy, P. (Eds.). (2004). Revision: Cognitive and instructional processes. Dordrecht: Kluwer. This book draws together current research on revision from two areas. The first is the large body of empirical work on the cognitive processes involved in the revision of written language production. This research looks at how operations of revision intervene during various phases of writing, at the resources or constraints (e.g., working memory load, content knowledge, strategy use) that affect revision and at developmental aspects of revision capabilities. The second area of research concerns the study of students learning to revise texts in instructional settings. This research examines the effects of instructional design conditions (structure and sequencing of tasks, strategy instruction, word processing) and the impact of peer interactions on student acquisition of revision skills. #12: Björk, L., Bräuer, G., Rienecker, L., & Jörgensen, P. S. (Eds.). (2003). Teaching academic writing in Eurpoean higher education. Dordrecht: Kluwer. This volume describes in detail teaching philosophies, curricular structures, research approaches and organizational models used in European countries. It offers concrete teaching strategies and examples: from individual tutorials to large classes, from face-to-face to web-based teaching, and addresses educational and cultural differences between writing instruction in Europe and the US. #11: Ransdell, S., & Barbier, M.-L. (Eds.). (2002). New directions for research in L2 writing. Dordrecht: Kluwer. This book describes the current psycholinguistic research being conducted internationally on better understanding second language (L2) writing. It is based on an experimental research tradition arising from recent progress made in methodology, technology and theory in both native and second language writing. 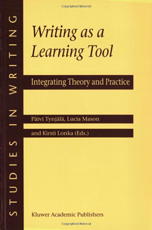 It is unique in that it is specifically geared to better understanding L2 writing and how it relates to L1 writing research in the psycholinguistic tradition. #10: Olive, T., & Levy, C. M. (Eds.). (2002). Contemporary tools and techniques for studying writing. Dordrecht: Kluwer. 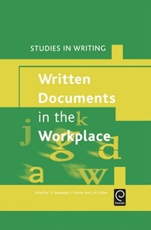 This book brings together methods designed by psychologists, linguists, and practitioners who aim to study writing both within the laboratory and the workplace. Its primary focus is upon the computer-based techniques and methods available today that enable and foster new systematic investigations of writing theories and processes. It is of interest to writing professionals, teachers of writing, as well as those, like journalists, whose careers depend on managing multiple constraints and audiences for their work. #9: Alamargot, D., & Chanquoy, L. (2001). Through the models of writing. Dordrecht: Kluwer. This book provides both young and senior scientists with a comparative view of current theoretical models of text production. Models are clearly situated in their historical context, scrutinized in their further evolution with a fine-grained observation of differences between models. Very complete and informative to read, this book will be useful to people working in teaching of writing or studying this specific human activity. #8: Tolchinsky, L. (Ed.). (2001). Developmental aspects in learning to write. Dordrecht: Kluwer. This book is a developmental crosslinguistic and cross-orthographic perspective on learning to write from preschool up to university level, from children's earliest conceptions of the meaning of writing up to university students struggling with the meaning of computer writing. It includes original research in three different writing systems (Roman, Hebrew, and Chinese) and six languages (Chinese, German, English, French, Hebrew, and Spanish) in different knowledge dimensions of writing: general meaning and function of writing, graphic conventions, punctuation, morphology, and discursive organization. The authors demonstrate that writing is a source of knowledge that triggers cognitive and linguistic development. They also show that the study of writing development is of crucial importance for developmental psychologists, psycholinguists, curriculum planners, and teachers at every educational level. 4. The development of graphic words in written Spanish: What can be learnt from counterexamples? 7. Talking and writing: How do children develop shared meanings in the school setting? #7: Tynjälä, P., Mason, L., & Lonka, K. (Eds.). (2001). Writing as a learning tool. Integrating theory and practice. Dordrecht: Kluwer. #6: Camps, A., & Milian, M. (Eds.). (2000). Metalinguistic activity in learning to write. Amsterdam: Amsterdam University Press. The volume presents empirical research on metalinguistic activity in the process of learning and teaching of writing. Contributions from educational psychologists, researchers in language education, and cognitive psychologists from different countries will address the incidence of metalinguistic activity during the composition process in different settings, from primary to university levels, and offer methodological issues concerning research on this specific topic. 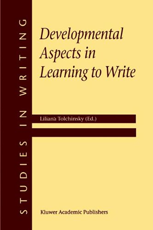 This book is recommended to developmental researchers in the area of writing competence acquisition, to language teachers and trainers and to writing researchers interested in the complex sociocognitive processes of writing and learning to write. #5: Courier, P.†, & Andriessen, J. (Eds.). (2000). Foundations of argumentative text processing. Amsterdam: Amsterdam University Press. Argumentative text processing is concerned with the psychology of the production and comprehension of argumentative texts. 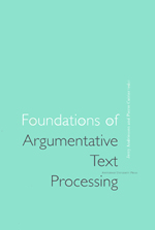 This volume contains a collection of papers which each provide a survey of the state of the art in research on argumentative text processing. The rationale behind the choice of topics is our focus on fundamental components of the argumentative process. To this end, the chapters discuss the topics of reasoning, argumentative theory, social context, interaction, development, knowledge, planning and translating, education, collaboration and electronic argumentation. Although the focus of this book on written text production, it also contains a number of chapters on oral argumentation. This book is the first that has assembled the world's leading scholars on argumentation to discuss these issues. It should serve as a basic overview of the field for many years to come. #4: Torrance, M., & Galbraith, D. (Eds.). (1999). Knowing what to write. Conceptual processes in text production. Amsterdam: Amsterdam University Press. 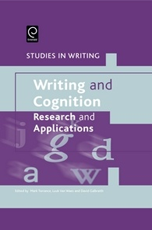 Knowing What to Write brings together new and recent research and theory exploring the cognitive processes involved in retrieving, ordering and creating knowledge during text production. Contributions from cognitive psychology, text linguistics, psycholinguistics, and computer science combine to provide a sophisticated and wide-ranging picture of the ways in which writers develop and structure their ideas. This book is recommended both to writing researchers and to any readers interested in the cognitive processes that lie behind complex language behavior. 6. Accessing referential information during text composition: When and why? #3: Torrance, M., & Jeffery, G. (Eds.) (1999). The cognitive demands of writing. Processing capacity and working memory effects in text production. Amsterdam: Amsterdam University Press. Writing is a complex activity that places demands on cognitive resources. This volume presents original theory and research exploring the ways in which the sub-components of the writing process (generating and organizing content, producing grammatical sentences, etc.) 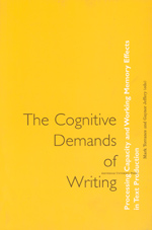 differ in their cognitive demand, and examines how writers manage these when producing text. The book is recommended to writing researchers, cognitive psychologists and psycholinguists with an interest in attention and working memory in language production, as well as to any reader who seeks an understanding of the cognitive mechanisms that lie behind the writing process. #2: Rijlaarsdam, G., van den Bergh, H., & Couzijn, M. (Eds.). (1996). Effective teaching and learning to write. Current trends in research. Amsterdam: Amsterdam University Press. Effective Teaching and Learning of Writing describes the current state of the art in research on the way in which children acquire skills in written text production and defines the features of instruction that can play a part in teaching such skills. The book discusses research by 'reflective practitioners', the use of computers in the solution of educational problems and formal research into effective approaches to the teaching of writing in primary and secondary education. In the concluding section feedback procedures and effective peer-group interaction between pupils and interaction between pupil and teacher are focused upon. 16. Can the ability to monitor local coherence in text comprehension be transferred to writing? 25. How does access to a computer network affect writing students' interaction with peers and teachers? #1: Rijlaarsdam, G., van den Bergh, H., & Couzijn, M. (Eds.). (1996). 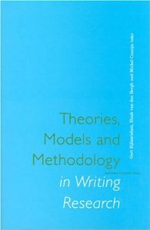 Theories, models and methodology in writing research. Amsterdam: Amsterdam University Press. Theories, Models and Methodology in Writing Research describes the current state of the art in research on written text production. The chapters in the first part offer contributions to the creation of new theories and models for writing processes. The second part examines specific elements of the writing process, such as lower order processes, cognitive load, revision and planning. Part three also discusses the specific elements of the writing process but examines them from the point of view of developmental psychology. The final part contains chapters dealing with aspects of research methodology. 1. Is writing expertise like other kinds of expertise?